Another day of not too much excitement. 🙂 My ankle is feeling better. Had a few pain jolts, but not too bad. I did consider going out for a walk, but decided not to push. I did go to bowling, though I bowled really badly. A few weeks back, I did the 23andMe.com Health + Ancestry kit. I got in results today. No major issues popped up in the health portion. William, you have one of the two genetic variants we tested. Hereditary hemochromatosis is caused by certain combinations of genetic variants. People with only one copy of this variant are not likely at risk of developing iron overload related to hereditary hemochromatosis. Seems like nothing to be concerned of here really. William, your genes predispose you to weigh about 6% more than average. This predisposition doesn’t mean you will definitely weigh more than average. Keep in mind that your lifestyle and environment have a big impact on your weight. Dang it! I am big boned! haha. Honestly, nothing major. Nothing here keeping me from a healthy lifestyle. William, your genetic muscle composition is common in elite power athletes. Studies have found that almost all elite power athletes (including sprinters, throwers, and jumpers) have a specific genetic variant in a gene related to muscle composition. You have the same genetic variant as these elite athletes. Overall, pretty neat stuff. I got to see I have a bit more of British and Irish in my then I knew. 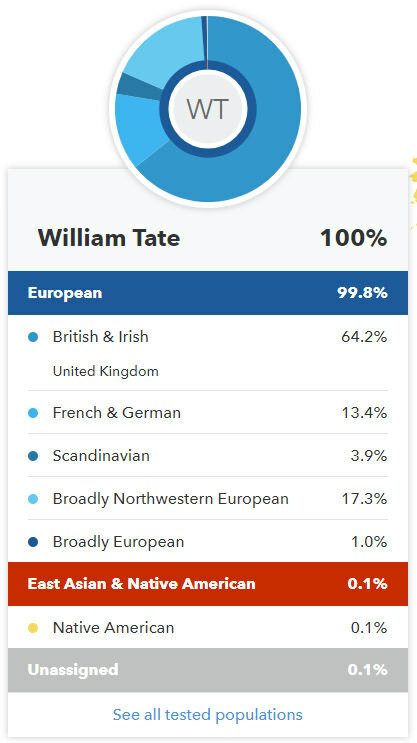 I also thought there would be more Native American since I had some relatives on both sides of the family. Just a long time ago I guess. Will just give a quick update from yesterday. 12:12 am to 8:10 am. 6 hrs 48 mins. 19 x awake for 1 hrs 10 mins total. I didn’t get in my reading last night. Instead I finished watching Lost in Space on Netflix. Got into bed on time, but really did not sleep well. No exercise done. Just a few steps in. 2131 steps. Taking my car in for some service. My son is also sick, so he has a doctor’s appointment. I don’t think I will walk, but I may. I think I might rest more, and just focus on getting some things done around the house. I did that a bit today.